First – check all your tags. Look at both sides. I foolishly wrote my email address on the back of my tags and haven’t heard from some of my scarf recipients. Maybe you’ll get lucky. I know some recipients have had success posting a photo of their scarf with the name and location of their scarfmaker to Old South Church’s Facebook wall. Messages have even been relayed back from scarfmakers who aren’t on Facebook. Also, if you have blogged about your scarf, don’t forget to post a link to your blog on Old South’s Facebook wall. Others have Tweeted or blogged their thank yous and been connected that way. One blogger found both a fellow recipient and his scarfmaker. You can try posting to whatever social media sites you use, although I believe there’s been the most success connecting on Facebook. You can also search for yarn or fabric stores in the town where your scarfmaker is from. Try contacting the store – your scarfmaker might be a regular customer! If you’re really determined you could contact all the yarn stores in their general geographic area. However, if your scarf was made with acrylic yarn, it was most likely purchased at one of the big box craft stores (AC Moore, Michaels, JoAnn Fabric, Hobby Lobby, Ben Franklin). If your scarfmaker is from a small town then the staff might have heard about the project and know the scarfmaker but in larger communities the staff at those stores may not be able to help. If you have an organization name such as a knitting group, church, senior center, or school, you may be able to find them on Facebook or find contact information with a web search. I was able to find the email address of a principal at a school that participated and sent them links to thank yous for scarves their students made. I don’t know what percentage of scarves came via UCC churches, but since Old South Church is in the UCC denomination many of the scarves came from other UCC churches. The church name was usually written on the tag but it’s possible that some scarfmakers delivered/shipped their scarves independently. Try searching for the town, state, UCC, Marathon Scarf Project and you may turn up blog posts or bulletins from churches that contributed to the project. They often have photos so you might spot your scarf! You can also enlist the help of the media in the area where your scarfmaker lives as this runner did (within a week they found the scarfmaker!). I have also heard of a couple of letters to the editor sent to local papers in the scarfmaker’s town. You might want to try finding the Facebook pages of organizations in their area. This runner thanked his scarfmaker on the Facebook page of her local paper. A few scarfmakers have blogged about their scarves or been covered by the media. 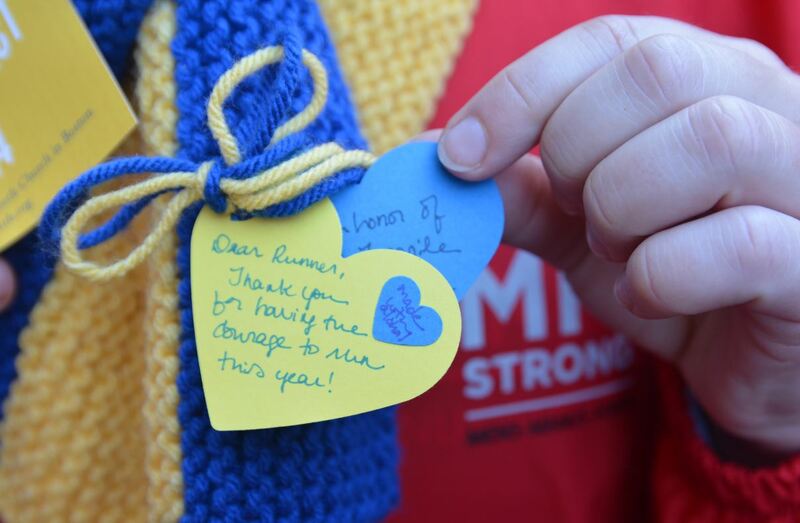 You can do a Google Blog Search for blogs that have mentioned the Marathon Scarf Project. Search for “Marathon Scarf Project” and look for older posts from March and early April. More recent posts are by runners. I have links to scarfmaker profiles in the media at the bottom of this post. Join our Ravelry group (login required)! Don’t forget to post your scarf (or scarves) in your projects and then share with the group (there’s a drop down menu on each project page that says “Share with a group…”). Once you’ve done that you can also post a photo in the forum. If a Raveler recognizes your scarf in their Internet or real life travels they’ll let you know. I chased down a man on Boylston Street after recognizing his scarf from Ravelry! A lot of recipients are posting their thank yous to Old South Church’s Facebook page either as comments on this post or on their wall. Some thank yous have been posted as comments elsewhere on Old South’s Facebook page, so you may wish to look at other posts. If you have an account, look in the “Recent Posts by Others” section. You do not need to have a Facebook account to see these posts although you would need an account to reply. If you don’t have an account you can view photos here (hover around the middle of the left side of your browser and you’ll see an arrow – click on that to go forward in time) or photos and text only posts here (you’ll have to click “Show More” a lot – 2014 doesn’t show all of this years posts for some reason). If you do find your scarf recipient, send them a public message as well as a private one. Many people don’t know they have to check a different folder for messages from people they’re not already connected to. You can check Twitter hashtags #marathonscarfproject and #marathonscarves. You can check Instagram hashtags #marathonscarfproject and #marathonscarves. 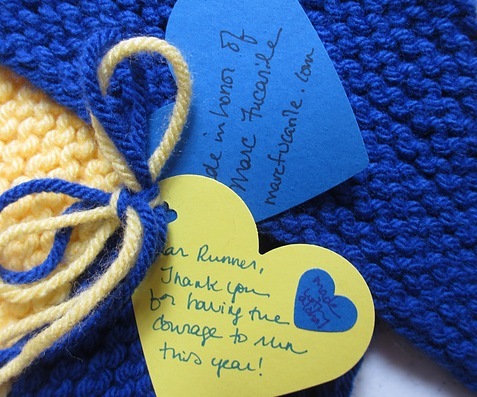 You can do a Google Blog Search for blogs that have mentioned the Marathon Scarf Project. Search for “Marathon Scarf Project” “marathon scarves” “marathon scarfs” “marathon scarves boston” “marathon scarfs boston”. You can also do a web search for your “[first name] from [town]” (in quotes) with and without “Marathon Scarf Project” and your state. This may lead you to Facebook or blog posts from your recipients. Search for media reports via Google News. While this may not help you connect directly with your scarf recipient, you may spot your scarf. I know a lot of scarfmakers who have seen their scarves on the news either on a recipient or a volunteer. Really lucky scarfmakers have gotten to see their recipients receiving their scarf. If you blog, write a post that includes photos of your scarf (or scarves) and the words Marathon Scarf Project, your first name, town, and state. That way if a recipient searches for your name and location they might find your blog. You may also want to include your email address if your blog uses a commenting system that requires a login. If anyone has any other ideas for how to connect scarfmakers and recipients, please leave a comment! Thanks so much for sharing this with the recipients of your beautiful scarves. I truly felt wrapped in love and courage on Patriot’s Day 2014. I’d love to know who received the two scarves I knit. I was so honored to be able to participate in this endeavor.